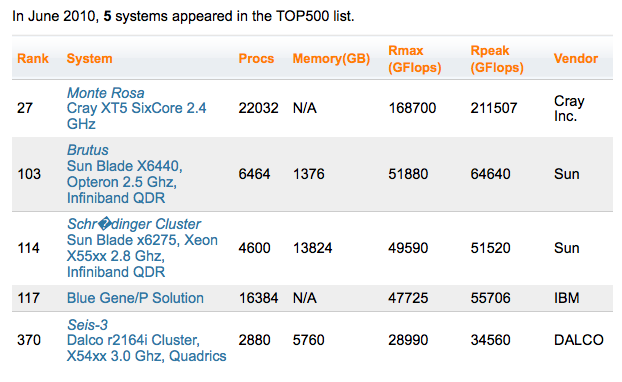 The new TOP500 list has been announced at ISC’10 conference in Hamburg. The big surprise has been the second classment of Chinese system called Nebulae, build from a Dawning TC3600 Blade system with Intel X5650 processors and NVidia Tesla C2050 GPUs. From the Swiss point of view there have been no big changes respect to the November 2009 list. Without substantial upgrades all systems ranked lower . For example Monte Rosa moved from position 21 to 27. Only Brutus of ETH Zurich has been upgraded but no re-run of Linpack has been posted to the list. Brutus real placement would be around position #88 (Rmax = 63-64 TF) instead of #103, the same rank as in the previous Top500 list.